The Haryana Government has decided to seek the opinion of the Advocate-General on the Punjab and Haryana High Court judgement declaring all areas notified by the Forest Department in 1997 under Sections 3 and 4 of the Punjab Land Preservation Act (PLPA), 1900, as “forest land”. The conductor of a bus belonging to Fatehabad depot of the Haryana Roadways allegedly pushed a woman out of the moving bus at Patiala when she requested him to stop the bus for a while as her husband had gone to the toilet. He also threw her luggage out of the bus. The state government has spent crores to provide potable water to residents of the town, but some localities still continue to get polluted muddy water for the past more than six months. After contemplation for long over the issue whether a student, who gets the top position in a course after getting his/her papers re-evaluated, be considered for the gold medal, the Maharshi Dayanand University authorities have finally made an amendment to the ordinance of Re-evaluation of Answer Books. A day after the BSP forged an alliance with the HJC, senior BSP leader from the Assandh area Shamsher Singh Gogi today rejoined the Congress, describing it as “honourable homecoming”. The Haryana Government has decided to implement the Children Education Allowance Scheme from July 1 next. The results of the Kurukshetra University BCom III examination, which was declared on June 14, has been revised. Six students, four belonging to Rewari district and two from Rajasthan, and a schoolteacher, Satender Manju, were killed when the jeep in which they were going to Arvind Residential Public School, Jhunjhunoo (Rajasthan), collided with a truck on the Singhana-Jhunjhunoo road on June 17. The Haryana Government has decided not to hold an entrance test for admission to the BEd course for 2009-10. The government feels that since the two notifications affect a large area of the state, the judgement will hit development activities. A meeting was held under the chairmanship of Chief Minister Bhupinder Singh Hooda here last evening to discuss the implications of the judgement. Since only a part of the 1997 notification was reproduced in the judgement, it was felt that perhaps the court wanted the areas of Panchkula, Ambala and Yamunanagar districts alone to be declared as “forest land” and not of the other districts. However, there was another view that the reproduction of a part of the notification was only for illustrative purposes and the judgement applied to all areas. In view of these contradictory views, it was decided to seek the opinion of the AG, who will also give his opinion on how to deal with the issues arising out of the judgement. Earlier there was a view in the government that the PLPA, which was enacted in 1990, was not in consonance with the demands of fast urbanisation and, therefore, it should be amended to strike a balance between the need to preserve the environment and the demands of development. Some officers feel that to declare an area as “forest land”, a special order is required under Section 4 of the PLPA. The 1997 notification was “general in nature” and, therefore, does not confer the status of “forest land” on the notified areas. However, the court has not gone into the distinction between “general” or “special” orders. It held that all those areas in which restrictions had been imposed on the cutting of trees under Section 4 of the PLPA by the 1997 notification, constituted “forest land”. If the judgement is implemented in letter and in spirit, the ongoing four-laning of the Panchkula-Kalka highway as well as the proposed Pinjore-Parwanoo bypass on the Panchkula-Shimla national highway may be in jeopardy as no non-forest activity can take place in forest land without the prior permission of the Centre. Realising the need for such projects, the Central Empowerment Committee has recommended to the Supreme Court that projects like roads, power transmission lines, metro and canals should be allowed in forest land. The apex court is yet to give its verdict on these recommendations. The cops manning a police post near the Patiala bus stand helped the injured woman in finding her husband and also helped them catch the next bus for Ratia in Fatehabad. The incident occurred on Wednesday. The Punjab police arrived in Ratia on Thursday to record the statement of the woman identified as Rani Bai, who is recuperating in the Ratia community health centre. The bus conductor, Sham Sunder, and the driver, Umed Singh, have been suspended. The woman and her husband, Anwar Khan, had taken the Haryana Roadways bus coming from Shahtalai (Himachal Pradesh) from Nangal Dam to reach their village Dhani Bilaspur, where a large number of Bhakra oustees reside. Anwar got down the bus at the Patiala bus stand to go to the toilet. Meanwhile, the conductor blew the whistle and the bus started moving. Rani Bai requested the conductor to stop the bus for a few seconds as her husband had not come, but the conductor allegedly refused to oblige. When the bus came out of the bus stand, the “irritated” conductor pushed the woman out of the bus and the vehicle sped away after that. Some cops stationed at a police post near the bus stand helped Rani, who had sustained injuries. After getting a written complaint about the act of the conductor, the cops helped the couple catch the next bus to Ratia. General Manager of the Haryana Roadways, Fatehabad depot, OP Bishnoi said the conductor and the driver were suspended today. He said he had not received any formal complaint in this regard so far. The matter was brought to his notice by the sarpanch of the village. He said a departmental inquiry into the conduct of the roadways officials had also been ordered. Failing to get any relief from the Public Health Department, a large number of women from Dogran Gate, ward no 30, here reached the local mini-secretariat here today to highlight their grievances in the monthly grievances committee meeting chaired by Education and Transport Minister Mange Ram Gupta. The women also brought bottles filled with dirty water to press their point. The women said they had been getting contaminated water for the past more than six months. They first lodged their protest in November 2008 with some junior functionaries of the department at Gandhi Park office. They again visited the officials in May, but to no avail. They said they had been getting water for their needs from a submersible pump installed in their locality, but this pump could not fulfil the demand of so many people. 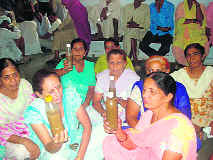 Later, the women produced the bottles of dirty water before the minister and DC Amneet P Kumar. The XEN, water supply and sanitation department, KK Verma said the muddy water supply was due to the installation of a high speed motor at one of the tubewells and the situation would improve within few days. The minister and the DC directed the XEN to ensure supply of potable water in this area through a water tanker till the situation improved. As per the amendment, a student getting the first position after re-evaluation will now also be entitled, along with the original topper of the course, for the award of the gold medal. A decision to this effect was taken at the university’s Academic Council meeting held under the chairmanship of Vice-Chancellor RP Hooda here today. According to the existing clause 4.2 of the ordinance, the marks achieved as a result of re-evaluation are not counted towards determining the position in order of merit, distinction and award of the gold medal. Gogi, considered a strong supporter of Congress MLA Bijender Singh, had deserted the Congress a few weeks before the Lok Sabha elections. After the expulsion of Varinder Singh Maratha three days ago, it is another jolt for the BSP, making a determined bid to improve its performance in the coming Assembly poll. Gogi is a strong contender for the Congress ticket from the Assandh Assembly constituency, where the BSP had polled just 800 votes less than Congress. Gogi said his “heart and soul” were always with the Congress and he had left the party due to some misunderstanding with some leaders, which had been cleared now. Meanwhile, supporters of the HJC and the BSP today welcomed the alliance between the two parties by distributing sweets in the city. A letter issued by the Finance Department says under the scheme the “actual fee paid” by the state government employees to the school would be reimbursed. The “actual fee paid” includes the component of tuition fee, admission fee, laboratory fee, special fee charged for agriculture, electronics, music or any other subject, fee charged for practical work under the programme of work experience, library fee, games/sports fee and fee for extracurricular activities. Under the scheme the reimbursement will be made at the maximum rate of Rs 500 per month per child subject to a maximum of Rs 6,000 annually per child. The reimbursement can be availed of by the employees up to a maximum of two children and in all such cases where there are more than two children in a family switching over from one child to other shall not be permissible. The education allowance will be available for children studying up to class 12. Stating this to mediapersons here today, KU Controller of Examinations, Dr Hukam Singh, said earlier due to non-receipt of internal assessment marks of some regular students, their result was declared as “result late” (RL) and a provisional list of the first, second and third positions, subject to the finalisation of RL cases, was declared on June 14. He said now the results of RL cases had been finalised and the revised merit list released. The first five positions had gone to Sinam Kumar, Arya Girls College, Ambala Cantt (1537/1800); Naveen Kumar, SA Jain College, Ambala City (1487/1800); Mamta, Hindu Kanya Mahavidyalaya, Jind (1468/1800); Sheffy, Dayal Singh College, Karnal (1461/1800); and Manisha Goel, JC Mahila Mahavidyalaha, Assandh, Karnal (1456/1800), respectively. The mishap occurred when the students were being taken from their villages to the school at Jhunjhunoo after the end of the summer vacation. Four students of Rewari district who were killed in the accident have been identified as Deepak, Pankaj, Baljit, residents of Kathuwas village, near Rewari, and Sachin of Bas Batodi village, 22 km from Rewari. Chief Minister Bhupinder Singh Hooda said here today that admission to the course would be made on the basis of merit in the qualifying examination. The eligibility for admission to BEd would be a minimum of 45 per cent marks for general category candidates and 40 per cent marks for SC category candidates in the qualifying examination. Maharshi Dayanand University, Rohtak, would coordinate admission to the BEd course for this session and the admission would be made online through centralised counselling by the university. The colleges had been directed to complete the first counselling by August 17 and the second by August 31. No admission would be made thereafter.